Oheo Gulch (The Seven Sacred Pools): A Happy Accident! We ended up at Oheo Gulch by accident really. As we were finishing up our Pipiwai Trail hike, our guide mentioned that we would have time to check out the a short 1/2 mile trail that takes you around the area. Since we love to explore, we jumped at the chance! 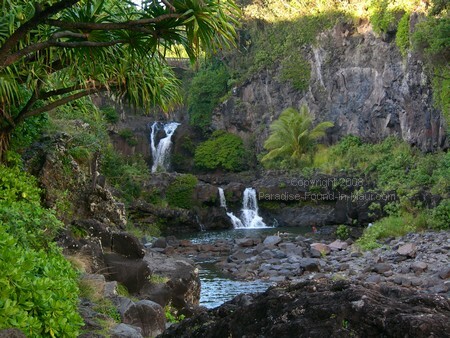 THESE were the famed "Seven Sacred Pools" that we'd heard about prior to our Maui, Hi vacation! We now know that "The Seven Sacred Pools" is not the correct name for these pools, and in fact, is quite misleading! First of all, there are way more than 7 pools, and secondly, the area is not sacred. Apparently the "Seven Sacred Pools" name was concocted decades ago to pique the interest of us tourists. The name seems to have stuck though, since many popular Maui guidebooks still refer to this site by the incorrect name. The views we found here were just gorgeous! 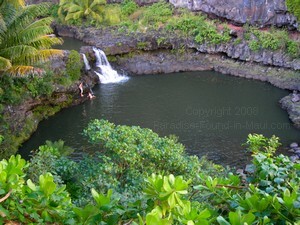 If you look at our pics of the pools really closely, you'll see that there are some people swimming here at Oheo Gulch. We weren't able to do this ourselves due to time constraints. But, I'd like to come back here on a really hot day just for the sole purpose of swimming here! I think it would be amazing to swim in such beautiful surroundings! If you want to swim here too, there are a few things you need to know about though! 1) This area is susceptible to flash floods. It was sobering to read on a sign here that people have been swept over waterfalls and washed out to sea here! To minimize your risk of being swept out to sea during a flash flood, be sure to check with the park rangers before you enter the water. The park rangers will be able to tell you if the risk of flash flooding is high or not. 2) Do not dive or jump into the pools... enter them carefully! There may be submerged rocks that you can't see until you're in the water, and the last thing you need on your Maui, Hi vacation is a trip to the hospital from an injury! 3) It is not safe to swim in the ocean areas here. A sign warns of dangerous currents, rough surf, sharp rocks, and the presence of grey sharks in the area. 4) Last but not least, the water here will be COLD! (This is a mountain steam, after all!) After having gone for a swim further upstream (with our guide) and experiencing this icy cold water for myself, I would only want to swim here if it was a HOT day outside! There is a large gravel parking lot here. Alongside the parking lot, you'll find some restrooms. Be sure to bring along some mosquito repellant. Also, since there is nowhere to purchase food or beverages here, you'll need to bring your own. If you have children with you, walking the trail to the pools here should fit into your Maui family vacation quite nicely. The short trail is an easy walk, and as long as you don't need to bring a stroller along, you should be just fine! Drive Highway 31 south from Hana for about 10 minutes. Just past Mile Marker #42, you'll see the gravel parking lot for Oheo Gulch on the ocean side of the road. The trail that takes you to the beautiful views of the pools can be found just off the large gravel parking lot here and will be an easy stroll for most. 1) Oheo Gulch is just below the trailhead for the Pipiwai Trail. Hiking the Pipiwai Trail was one of our favourite things to do in Maui - click here to read all about our experience! 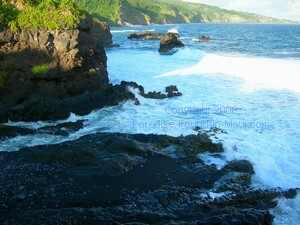 2) Read about more things to do and places to stay in the Hana, Maui area here.